These teaching notes fully support Oxford Reading Tree Fireflies Non-Fiction. Fireflies books include a variety of topics covering all areas of the curriculum, from science to citizenship. They have a bright modern page design, and are illustrated with colour photographs. The teaching notes for the Oxford Reading Tree Fireflies levelled non-fiction books are full of practical suggestions for using the books, saving teachers hours of preparation time. They have been updated in line with the simple view of reading and the renewed Primary Framework for Literacy. They now include guidance for group/guided reading, comprehension and word recognition, and assessment. 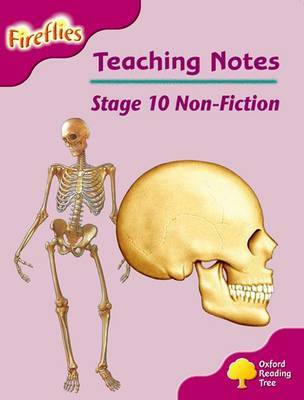 They replace the previously available Teaching Notes and Guided Reading Cards. The notes for parents/carers and teaching assistants have now been added to the inside covers. These notes replace the previously available Take-Home Cards.